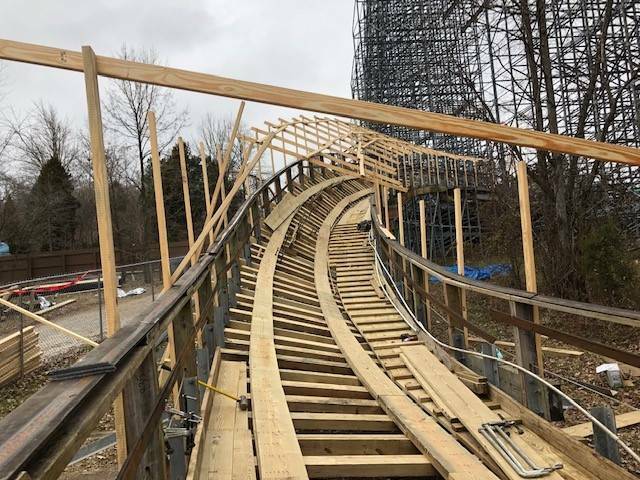 When we first started talking about adding a wooden roller coaster to our ride line up (this was waaaaay back in the early 1990s), we knew there was an important commitment we’d need to make. Because wooden coasters need lots of Tender Loving Care. Our trio of aggressive woodies has a special maintenance crew we fondly refer to as our Coaster Cats to keep Raven, Legend, and Voyage running right. During our off-season months, the Coaster Cats customarily concentrate on replacing segments of track. That’s all eight layers of track. This year’s designated coaster for the greatest amount of track replacement is The Voyage, which will get 650 of new track. Just what goes into replacing 650 feet of track? The section of track is the final 650 feet of Voyage’s 1.2-mile circuit. As winter starts to take hold, these tunnel-like structures are added and get the covered-wagon look, so the Coaster Cats can go undercover with their track work. Just think, in less than four months we’ll be open, the trees will be green, and The Voyage will be but a blur speeding through the woods. I went to Santa Claus Land as a kid. I am now 61 y ears old. Enjoyed every minute of it. I was able to win tickets for my grandson two years ago. They were 7-and 8. I am a little older but they enjoyed tremendously!!!! !